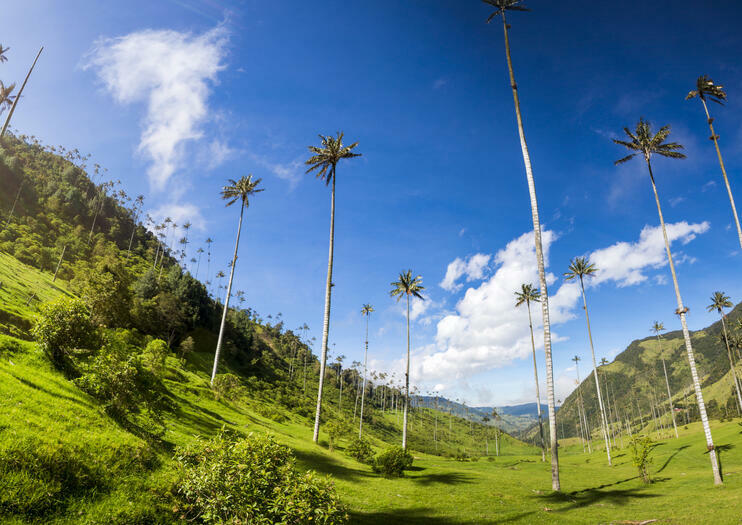 Long the go-to postcard image of rural Colombia, the Cocora Valley is an enchanting spot, characterized by its lush rolling hills, mist-capped mountains and tall, slender palm trees. Smuggled away in the foothills of the mighty Andes and at the heart of the UNESCO-listed coffee region, the serene valley makes a worthy detour from nearby Salento, if only to admire the startling views. The best way to explore the Cocora Valley is by hiking or horseback riding and a marked circular trail runs around the valley, affording magnificent views along the way. Hiking the entire loop takes around 5-6 hours and it’s an adventurous route, passing muddy streams, rope bridges and rocky trails, with some steep sections. Along the way, lookout points offer great views of the valley’s iconic ‘Palmas de Cera’ trees – the world’s highest wax palms that grow up to 60-meters in height – while the hilltop cloud forests harbor a huge variety of tropical birds and butterflies. The Cocora Valley is located in the Andes Mountains of Quindío province; around 30 minutes drive from Salento. Feast your senses on the sights and smells of Colombia’s coffee region on a private full-day tour to Cocora Valley from Salento. After you receive an interesting introduction to Colombia’s coffee culture from your guide, you’ll visit local coffee farm, El Ocaso de Salento, to taste aromatic Colombian coffee. Absorb spectacular views of the majestic Cocora Valley after a hike to a mountain lookout point before concluding your tour with hotel drop-off. Receive personalized attention from your private guide throughout the tour. Explore Colombia on a 12-day tour, visiting Santa Martha, Cartagena, Bogotá, Medellín, Tayrona Park, and the coffee region. Private transportation, overnight accommodations, and a dedicated guide are included as well as enough free time so you will have the flexibility to wander around by yourself as well.